I guess I can call it my city now. I've been here since April, that's past trial initiation period. 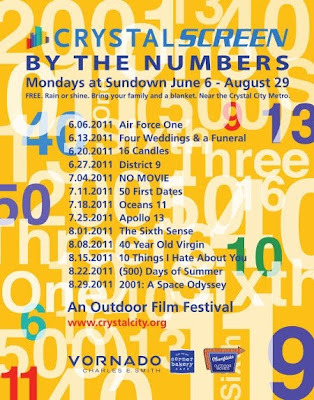 So, yeah- this summer, every Monday evening, in MY city there is an Outdoor Movie Festival that I think would be so fun to check out! I saw a poster for this on the "tro" (that's what I'm calling the metro now that's it's my city) and even though I don't really live in the Crystal City area but it would be so fun to grab dinner with my honey then head to one of these showings. 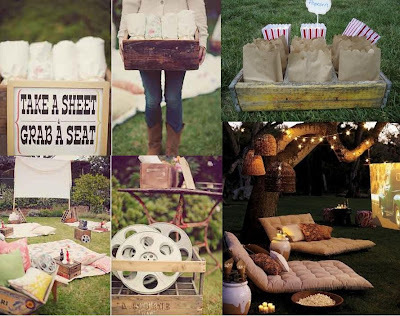 Or we could picnic-it-up! Also, how fun would an outdoor movie party be at home? Or for a kid's birthday? Cute kids party! We won't have movies outside but we will have fire : ) And marshmallows! I think it would be a fun date night! Do you have a hard time not calling the Tro the Underground? hehe, I have a hard time not calling it the tube!